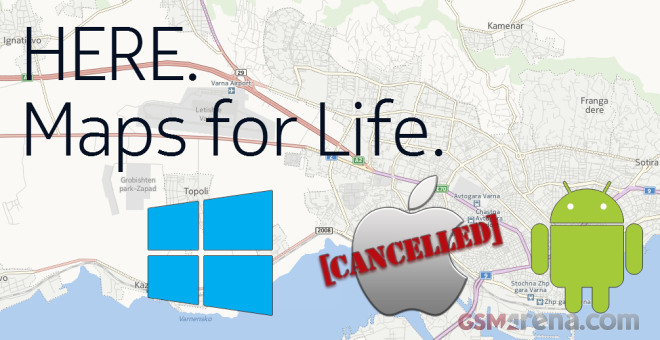 Nokia has taken down its Here Maps app from Apple’s App Store. It is no longer available for download and won’t come back in a while. The only way to access the Here services on the iOS is through here.com. There is no fallout between Apple and Nokia, at least we didn’t hear of any, but Nokia says the reason is in the iOS 7 recent changes. As we said, there is very little chance Here Maps to come back soon. That’s because Apple is highly unlikely to revert whatever changes Nokia is talking about. And it is one less competitor to Apple’s own Maps app. Here Maps had some issues on iOS – occasionally zooming failed, the app crashed, or was just unstable and unpleasant to use. Anyway, it’s gone now and only those who are restoring from iTunes backups will continue to have it after a restore. I believe the app will find its way back on the Apple’s iOS though, since the Here services will become a major business for Nokia after their Device and Services division goes to Microsoft next year. Nokia however is keeping the HERE location services to itself and will only be licensing them to Microsoft, so Nokia will have the opportunity to monetize the service on Android, iOS and car manufacturers.